Greetings! Salutations! And most importantly, Happy Friiiiiiiiday!!! What a week it has been... phew! I know I say that just about every Friday, but everyday this week was just crazy. Aaaand this weekend is Potty Training Boot Camp, because when things get busy, we just add in a whole lot more on top of it. Right? Right. This week, I drew the SAPPHIRE prompt. Luckily, my Rainbow Honey Berry Obsession Trio arrived in the mail this week, and Blueberry Obsession? Definitely channeling some SAPPHIRE sparkles! It was less than two weeks ago that I received the email about Rainbow Honey's Thanksgiving Mystery Bag and their Limited Edition Berry Obsession Trio. I ordered both that night, and was stoked when my packaged arrived on Monday! Soooo many new fun things to play with!!! Aaaaand as I was unwrapping, I found a mini Thistle Tresses and Nail Honey Cuticle Balm, a scent I've been meaning to try! It smells good enough to eat, but my nails really need the moisture! 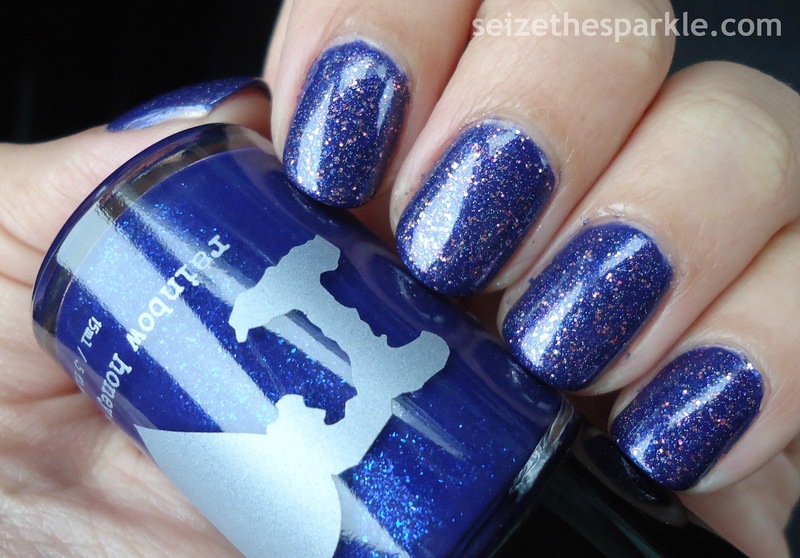 So, when I pulled the prompt SAPPHIRE, Blueberry Obsession just happened to be front and center on my nail desk. Along with about 60 or so other polishes, because I've been awful at putting them away. Does anyone else constantly waffle over organizing by color and brand? It's so frustrating. I really think I need shelves. But as usual, I digress! PR describes Blueberry Obession as a "blueberry cream with blue shimmer." It's a really nice shade of blue, too. Somewhere between an azure and admiral blue, and I love that the blue shimmer is a different shade. Holowhat?!? Yep. There's scattered holographic glittering totally hiding in there. It really lights up in the sun. That was a very cool surprise! I'm not sure if I'll be wearing this for another day, or if I'll be putting on another shade tonight. Potty Boot Camp starts tomorrow for Peanut, so we will not be leaving the house Saturday or Sunday. All day. Inside. And I can get cabin fever very easily! But I'm thinking it's going to go really well. She's showing such an interest in it, and she's been doing better with telling me when she needs to go. I've got my fingers and toes crossed, but I'm like 93% sure that she's got this. Happy Friday! Let the weekend begin!!! I'm not sure what it is this year, but I'm all about deep, dark, vampy shades of red and purple nail polish. I don't know if I'm just super excited for Thanksgiving and Christmas or what?!? But something about shades like these, they're calling my name. Now, that's not to say that the sparkles and such aren't trying to sway me. So, in case you were wondering from the photos, no, I didn't upgrade my subscription to full size. Rainbow Honey is waiting for their mini polish bottles to come back in stock, so mini subscribers got 2 out of the 3 mystery bag polishes in full size! Woohoo!!! 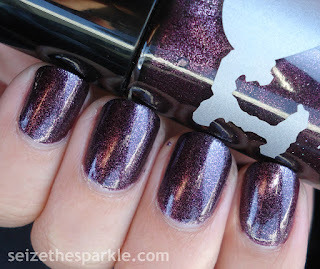 Bloody Weapon is a warm dark purple polish that is loaded with fine silvery shimmer. And I might be crazy, but I think there's a little sprinkling of scattered holographic glitter in here too. Every now and then, I catch a flash of random colored sparkle. Application was great. The first coat was a little patchy on a few nails. I used the second coat to wrap my tips, and a third to make sure everything was all smooth. Most people could probably get away with two coats. Today was actually the second day I wore this polish. I definitely put it on the night it came in the mail! Both times, the polish wore really well. This shade actually helped sway my decision to order the Berry Obsession Trio from Rainbow Honey, in addition to the Thanksgiving Mystery Bag. In my defense, there's been a serious drought in drugstore polish land. But that's a story for a different day. I'm just hoping that the Berry Obsessions apply just as nicely as Bloody Weapon. Aaaaaand every time I type that name, I'm still a little bitter that I missed out on Sapphire Weapon. Definitely look for pics of my Rainbow Honey haul on Insta. 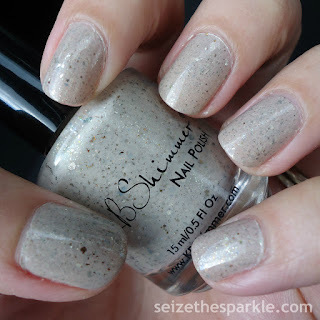 I'll be blogging about the polishes here in more detail as I wear them. Other than that, NaNoWriMo is going pretty well. I'm behind, but I'm hoping to catch back up. The weekends really are my demise. There's like zero time for anything on the weekends. I can't be the only one who feels that way?!? But I did get a lot of cleaning done yesterday, so YAY for that! Finally, the end of the week has arrived! They don't call it Fri-YAY for nothing, now do they?!? If you've had a particularly crazy week... you are definitely not alone. When I pulled the NEUTRAL prompt last night, I was kind of excited for something a little more calm and soothing. Opposite of crazy. 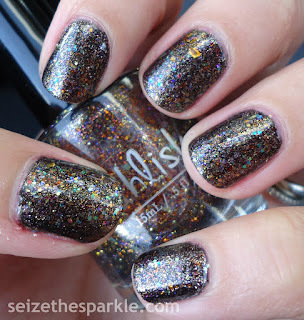 So, before I started gushing about the gorgeousness that is Owl Miss You from KBShimmer... I feel like I've got to say something about their ordering, shipping, and turn around time. It. Is. AWESOME. Especially when you place your order on a Monday, which is exactly what I did. My order arrived yesterday around noonish. 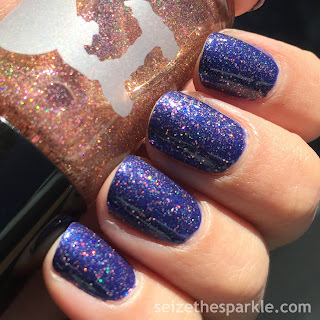 Owl Miss You is part of KBShimmer's Winter 2015 Collection. 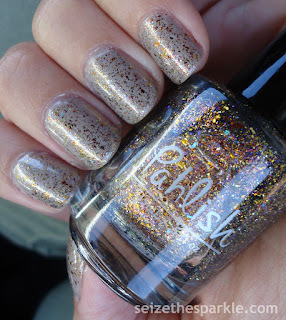 It might be the only polish from the collection I ordered, but that doesn't mean others aren't on my wishlist! I'm really trying to be good right now. In fact, I'm on a mostly no-buy until Black Friday. After that, I'll probably be on one 'til Christmas! I've got a soft spot for mixed metals, and that ranges from jewelry to nail polish. Owl Miss You caught my eye because of the silver, gold, and copper glitters and shimmer. It's definitely unique. PR describes it as "a soft beige neutral tan, this feathery polish is filled with golden metallic flakes and a bit of coppery metallic shimmer." I see that plus silver flakes and almost a platinum color flake. But, that might be due to using four layers of polish. Application was great, each coat went on as smoothly as the one before it. Dry time was great, too. I am really beginning to see why KBShimmer is so popular within the ranks of indie polish. I have yet to have an issue with any of their polishes. So... weekend activities! Peanut has a birthday party to attend tomorrow, and other than that, we'll be hanging out at home, working more on potty training. Next week is the official Boot Camp, and I'll definitely be writing about how it all goes. But for now, as you can probably tell, I've been a little absent here. That's mainly because I'm working really hard to complete NaNoWriMo this year. It's been a goal of mine for a couple of years, and I'm determined to do it! So, I'll be back a little more regularly come December. I don't have a ton of Zoya polishes in my collection. It's a brand that I have to buy online, considering the closest Ulta is almost an hour away, in the city we used to live in. And it's rare that I head up that way to do shopping these days. So, I usually end up buying Zoya when they have big promotions. I almost always go for the buy 3 pay only shipping. Quinn and Binx were part of an order I made in February with a code for 50% off my order. Quinn was ordered for obvious reasons, but I wasn't so sure about Binx. I waffled a little bit before I finally clicked order. But I'm so glad I did! Quinn is described by Zoya as a "very rich red-berry with slight purple undertones in a glossy creme finish." I would definitely agree with that. I think Mulberry when I look at it. Sadly, my camera blasted out some of the blue undertones in the polish, so it's not quite as red as what you're seeing in the photos. 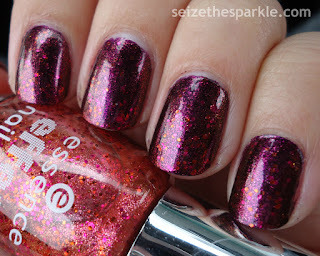 Binx is touted as a "spicy orchid purple dappled with gold metallic and holo sparkles." I definitely agree with the gold metallic sparkles, but the other glitter is definitely more of the translucent, opalescent variety. I don't think that I've ever used it before, and quite honestly, I was surprised with the amount of gold shimmer in this polish. Pretty sure it would look really pretty over a darker blue, but probably over lighter colors too. Just a great mix of glitter. 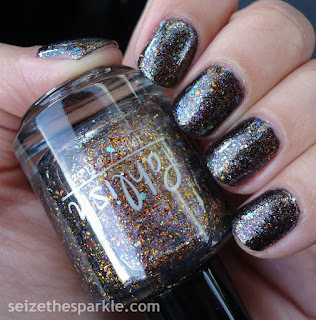 Now, if I were behind the making of a shade called Quinn, I would have to add glitter. Why? Because my little girl's smile and laugh are just so contagious. She's a vibrant little living sparkle. Hence the name Sparkle Girl! I love the way these two shades play off each other. 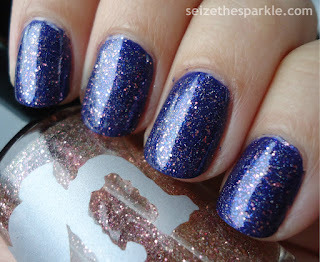 Quinn is a really gorgeous mulberry creme that feels so right now, but not in a trendy way. This is definitely a classic shade. Adding Binx in on top just makes it that much more fun, and oddly Holiday appropriate. Not that I was going for that, but hey! I'll take it!!! As of right now, I can't say that we have too much planned this weekend. Peanut and I will be working on potty training some more, and things have really turned around, so we're pretty excited about that! Other than that, I've got a haircut scheduled. So, it's looking like a lot of hanging around home, playing, snuggling, and trying to make my word count when Peanut goes to bed! P.S. If you're NaNoWriMoing like me and need a buddy, feel free to send me an invite! 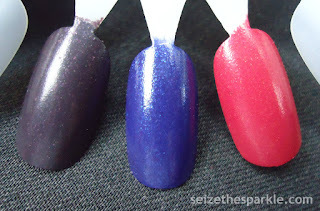 Space Cadet is a deep violet leaning maroon red with a matching maroon shimmer that shift gold. It's a gorgeous shade that is in a lot of nail polish collections. 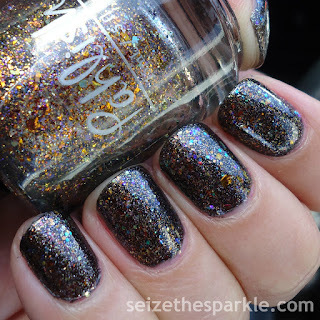 It was part of the Cosmix FX Collection Orly released in Fall 2010. The other part of this layering, Never Stop Dreaming, is an Essence polish I purchases this Summer from Ulta. I remember that the display was almost full that day. Most of the time, it's nearly empty or filled with polishes that aren't as lovely as this one. The base is a sheer orange leaning coral with red shimmer, and hex glitter in pink and orange. 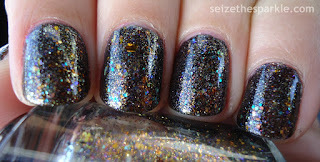 On its own, Space Cadet is a gorgeous polish, but I really like the sparkle Never Stop Dreaming added. I've been trying to find a way to wear this glitter topper for a while, and I love what it brings to this layering. It really reminds me of why I like layering polishes so much. Sometimes the final effect is obvious, and other times, it turns out even better than I expected. I know, I know, I was really trying to think of something to layer this over other than taupe. But then I remembered how pretty and shimmery Prosecco was, and it just sort of happened. And it's a glittery kind of wonderful, isn't it?!? First of all, it's been a little while since I used one of my SinfulShine polishes on its own, and it made me a little sad that the line was reformulated. Now, SinfulShine polishes are actual gel polishes that require a special top coat in order to seal everything together. I like to change my polish way too much for that, but the reformulation did bring back Prosecco. And that's a good thing, because Prosecco is the last polish the nail blogging world collectively swooned over. Hard to believe that was a whole year ago. I feel like we're swooning less these days, but that's a completely different topic for another day. In my original swatches, I used three coats, but this time around, four was the magic number. Prosecco is an almost opaque purple leaning, grayish tan with super-fine shimmer that flashes mainly gold, but I see copper and green, too. It's thee perfect polish to layer underneath Autumn People. What else would you want underneath a "mix of red ultrachrome flakes, gold flakes, and multicolored chameleon flakes with neon purple shimmer?" Nothing, I tell you! These two go together beautifully!!! I can't say that I'll be changing my polish around tonight. Nope. I'm keeping this beauty on for at least another day, maybe two. In the meantime, I'll be giving my cuticles the love they lost during #31DC2015 and I may or may not be working feverishly on NaNoWriMo. (I totally am.) You know, as long as my nails don't distract me too much!